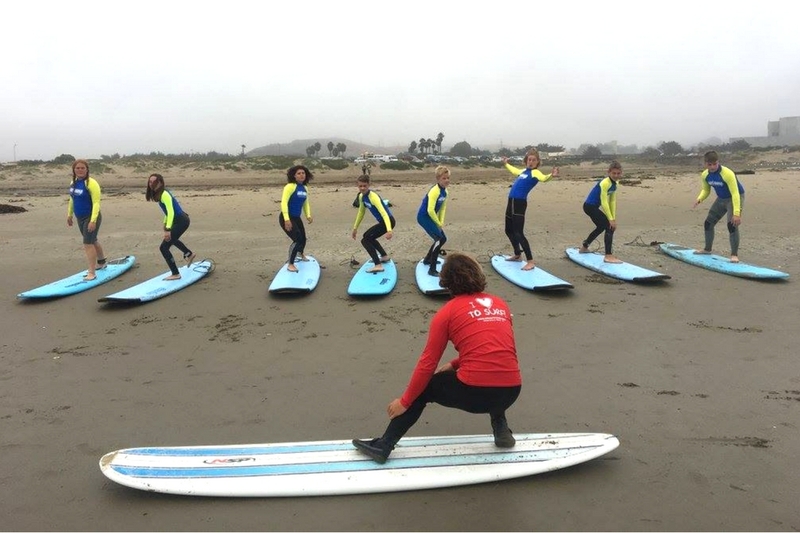 Experience the iconic surf culture of the West Coast as part of our Teen California Surf and Adventure Camp. Travel to the state that helped revolutionize the sport and learn to surf in the wake of legends. Our unique program will take you away from the crowds to the famous Central Coast where you will be soaked in both the waves and the amazingly diverse marine environment. We will travel the coastline from the Monterey Bay Aquarium down to the Santa Barbara Channel, staying in cabins and camping in tents to experience all the beauty California has to offer. During this 13-day program, you will be individually coached by our professional staff using our proven teaching methodology to develop a strong base of surfing fundamentals regardless of experience. 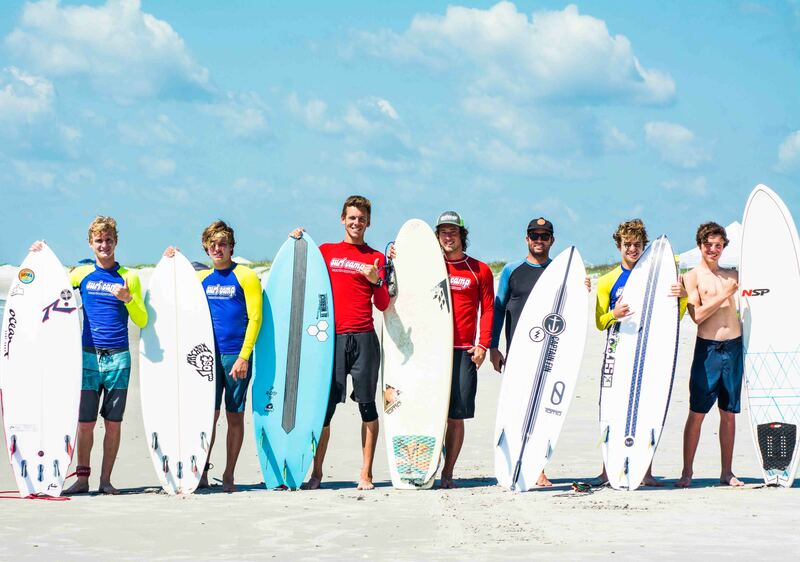 This summer camp is designed for beginners with no prior surfing experience, while intermediate surfers will be able to further hone their skills. 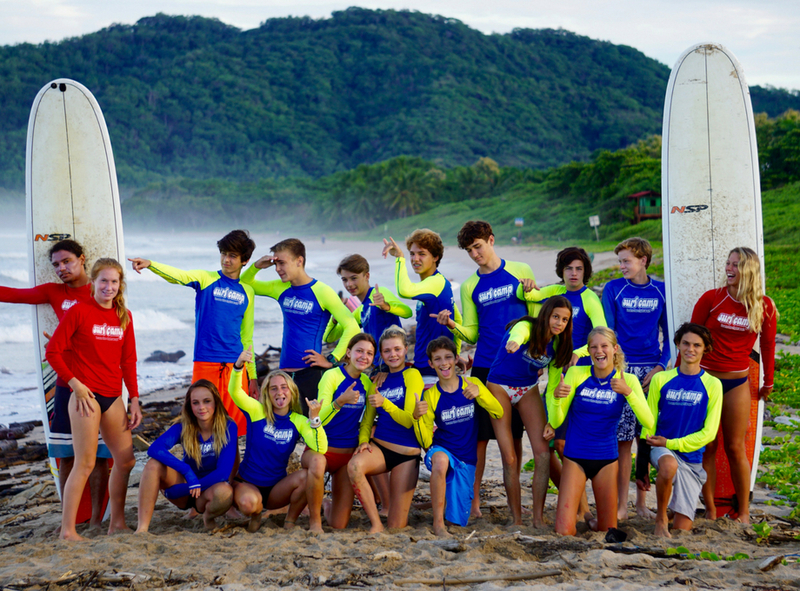 During this camp you will be provided with the tools to continue a lifetime of surfing and ocean exploration. Due to the dynamic shape of the coastline, swell and wind directions have a huge influence on where and when to surf. By learning local weather patterns and studying swell charts, participants will gain first-hand knowledge of wave dynamics. The central California coast is host to numerous world class breaks. We’ll seek out the best waves, and in turn learn the fundamentals of oceanography in our experiential adventure. Tuition is listed below, and includes lodging, camping tents, meals, 24-hour adult supervision, shuttle to and from the San Luis Obispo Airport (SBP), equipment (surfboard rental and rash guard usage), professional guides & outdoor leaders, 10 hours of community service credit, daily transportation, WB Surf Camp t-shirt, activity fees, surftificate of achievement, and memorable group photo. To secure your spot now, please select from the available date listed below. Enrollment limited to 15 students per session. After flying to the West Coast, we know that you’ll be eager to experience the California lifestyle. 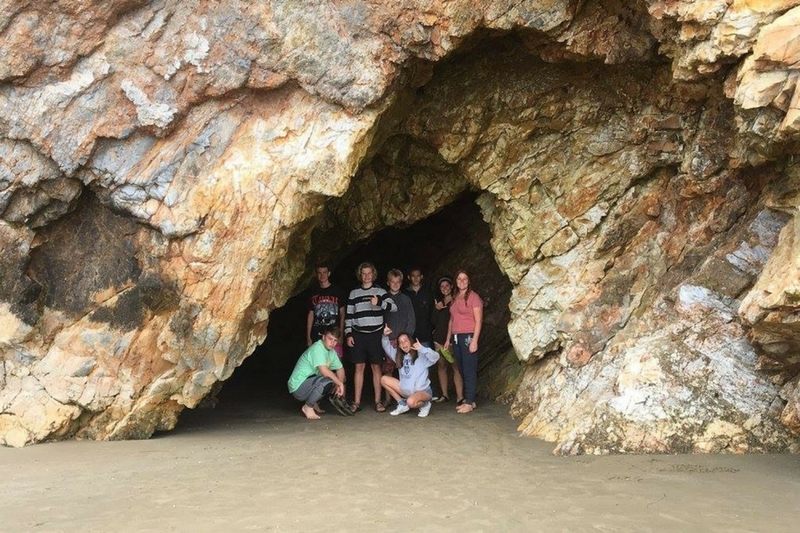 Your trip leaders will be waiting for you at the San Luis Obispo International Airport and then we’re off to our cozy cabins for orientation, after which we’ll eat dinner at a tasty restaurant. We’ll want to get a good night’s rest in for all the different adventures to come – starting with our first surf session to uncover all the hidden treasures of the Central Coast. First up, surfing! After sliding into our wetsuits, we’ll all go through Ground School, where our staff will talk about important surfing-related topics before we ride our first waves. Maintaining our safe 3:1 ratio, campers receive professional instruction from our lifeguard certified instructors throughout this adventure. Today, we’ll be charging again with a full day of surfing on tap, and we’ll be riding some of Morro Bay’s renowned breaks. We’ll occasionally stop and rest, giving us the opportunity to explore some local tidepools. The following day we’ll switch it up: instead of paddling on boards, we’ll paddle in kayaks to see the water from a different perspective. Exploring Morro Bay with the help of a local naturalist, we’ll glide along the estuary and then giving our tired arms a break, hike along the coastline learning about local flora and fauna in addition to the Chumash Indians who used to inhabit the area. Next, we’ll travel down the coast to Santa Barbara and check out Rincon, one of the most iconic west-coast surf breaks. We will visit a local shaper at the historic Channel Islands Surf Shop to provide some inspiration for our next day’s surf session, as well as check out the Santa Barbara Wharf. While in California, we’ll do our best to keep it as pristine as possible. We do this through periodic beach clean-ups and the community service we will participate in at the Sweet Springs Nature Reserve. Now it’s time to take our adventure on the road, as we head to the Monterey area. Once we arrive, we’ll settle into our cabins and then begin exploring local breaks like Moss Landing and La Selva Beach. To add some adventure, we’ll take a few short hikes, all of which offer incredible coastal views and some of the most photographed images in the Monterey Bay/Santa Cruz area. We’ll visit the famous Monterey Bay Aquarium where we’ll come face-to-face with sharks, seals, otters, sea lions, sea stars, and penguins. Finally, we will take off on a scenic bike ride along the Monterey Bay Coastal Trail for some different exercise and more amazing views! During our final days of this amazing trip, we return to some of our favorite surf breaks outside Morro Bay. 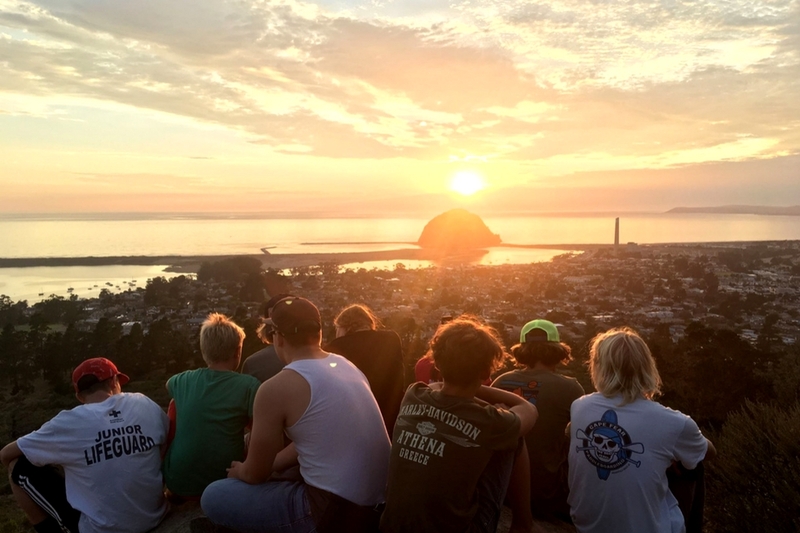 We’ll spend the last few days soaking up the surf, camping in sight of Morro Rock (a famous landmark), roasting s’mores, and enjoying beautiful sunsets. To recover from this action-packed two weeks, we’ll give our paddling muscles a nice relaxing soak at Avila Hot Springs. 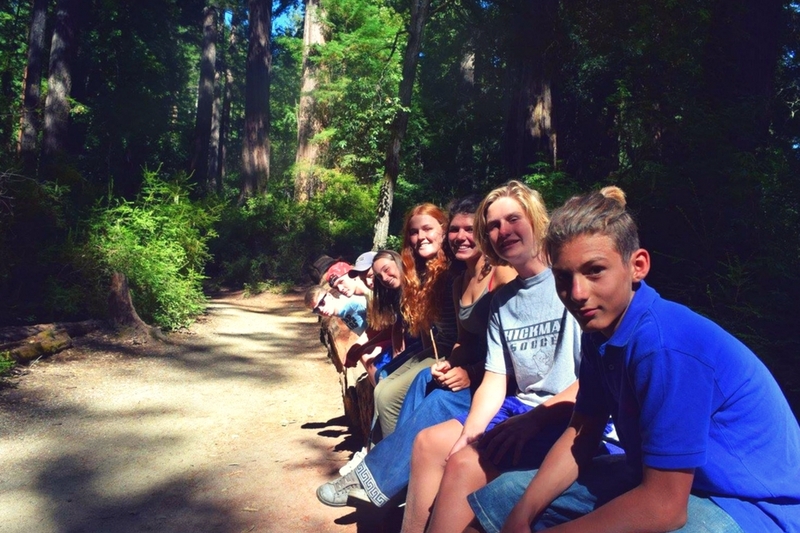 Throughout the two weeks our campers get to truly experience the California lifestyle. Paddling into waves, hiking through the forests, learning about local customs and people are all part of a unique experience that’s hard to match. As our last day of camp arrives, we say goodbye to the California way of life. But know that the memories we have made and the bonds we have formed will be with us forever. The California Central Coast has a moderate and pleasant climate year round. Summer doesn’t get too hot and winter doesn’t get too cold. The average summer temperature on the coast isn’t much higher than 68°F (20°C), and in winter it doesn’t drop much past 44 °F (7 °C). Ten minutes inland, it can be up to 20° warmer. The area has an average of 19 days of rain a year producing about 18 inches (47 centimeters) of rainfall, most of which occurs between November and April. It’s the perfect weather for camping, hiking, and exploring! The water temperature stays right around 60 °F, so even though you need a wetsuit, it’s not uncomfortable. What sets this incredible camp apart from the others is the sense of adventure it offers by combining a week of lodging in rustic log cabins with a week of camping along the craggy pristine coast in extra large two-room tents. S’mores and a crackling campfire each night are enhanced with stargazing into an illuminated crisp clear night sky with very little light pollution. You’ll fall fast asleep to the sounds of the waves off in the distance and dreams of surfing the clean Pacific rollers. Our lodging at the Santa Margarita KOA is a rustic campground carved into the side of a hill on 70 acres covered in oaks and pines. The grounds environment consists of panoramic vistas, rolling terrain, and secluded campsites which provide an amazing setting to begin or end a day of surfing. Designed with renewable resources in mind, their passive solar cabins are a unique blend of wood milled from wind fallen trees and straw bale construction. These bunk-style cabins sleep 10 people to accommodate groups of 35-100 and include indoor restrooms. A large lodge and dining hall with a cozy stone fireplace and sweeping ocean views serve as the focal point for meetings and meals. The Salina/ Monterey KOA have the comforts of a small beachside town and the quiet of a beautiful canyon. These grounds are in the heart of central California only minutes from Monterey and Santa Cruz. Here you will get to check out the Santa Cruz Board Walk, check out the Monterey Aquarium, and surf Moss Landing. Morro Bay State Park features lagoon and natural bay habitat. 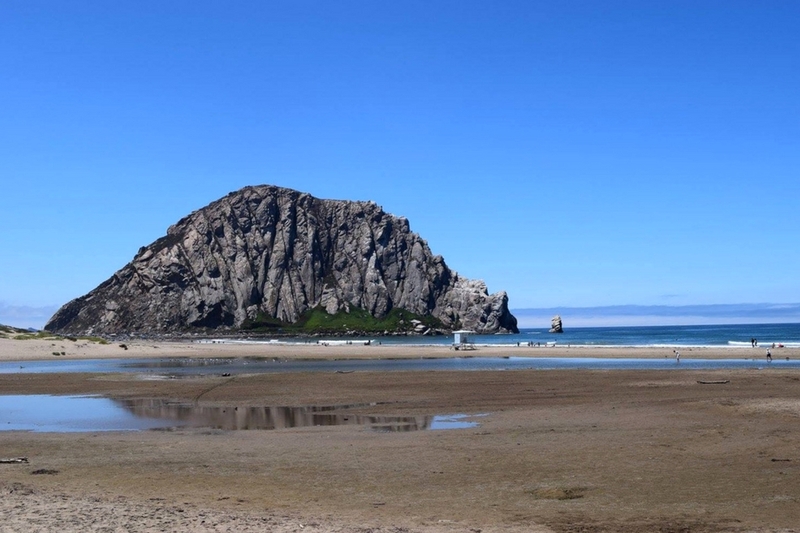 The bay’s most prominent landmark is Morro Rock. The park has opportunities for surfing, sailing, fishing, hiking, and bird watching. The Museum of Natural History within the park has exhibits that cover natural features and cultural history, Native American life, geology, and oceanography. 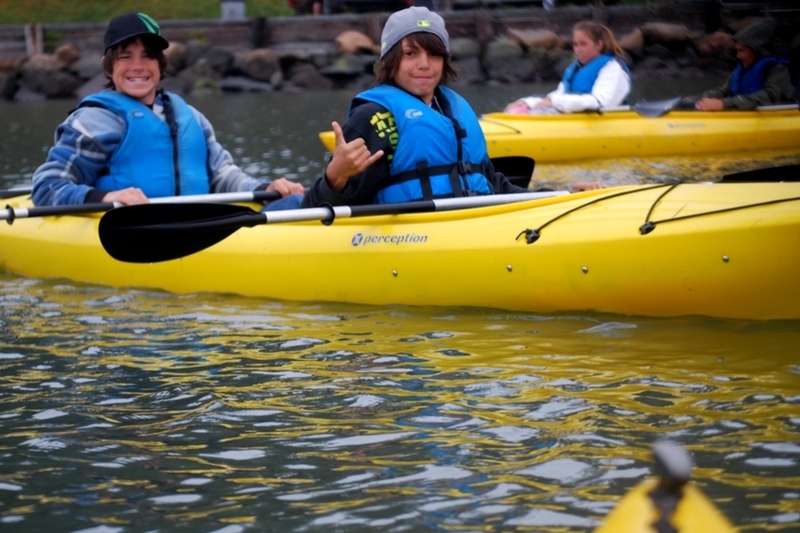 The park also has a colorful marina where we launch our kayak tour. On the bay’s northeast edge is a pristine saltwater marsh that supports a thriving bird population. Surfing beaches are only a few minutes drive from all of our accommodation locations. 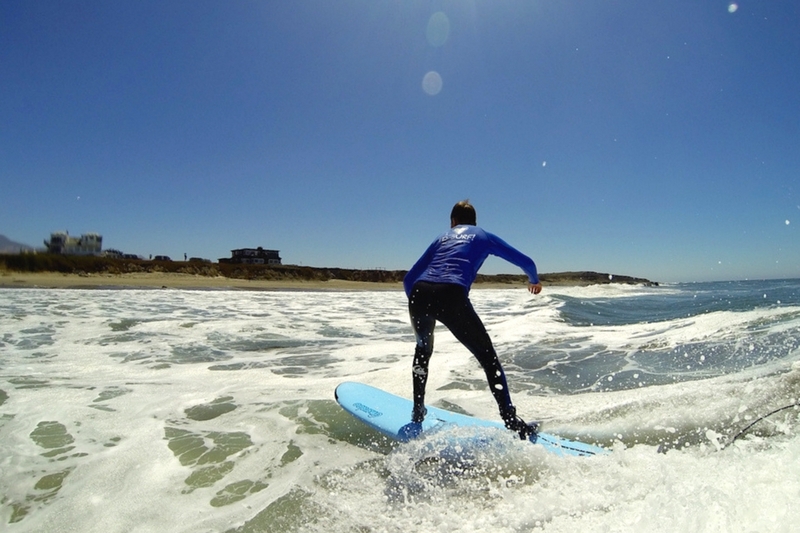 We will surf the Morro Strand, in and around Cambria, and Moss Landing. Depending on wind and wave conditions, we may explore the region to diversify our surfing and find the best breaks on any given day, but we’ll return each day to all of our location stoked and smiling. Campers will need to bring sleeping bags, pads, and mess kits along with a list of other important items, provided upon registration for the camping portion. Reena, Cincinnati, OH – “Throughout my week at your camp, I had a great time. I remember how good it felt when Joel praised me on my awesome pop-ups, even though we were only on land. I couldn’t wait to get out on the water and be able to stand. Eventually we paddled out and it was my turn to ride the wave. The rush of emotions I felt when the wave picked the board up and pushed me to shore was incredibly fulfilling. Even though I didn’t stand on my first try, I couldn’t wait to go out again. I tried again and again, but that day, I just couldn’t stand up and ride a wave all the way to shore. I was a little disappointed, but I kept telling myself that I would not leave this camp unless I rode at least one wave successfully. 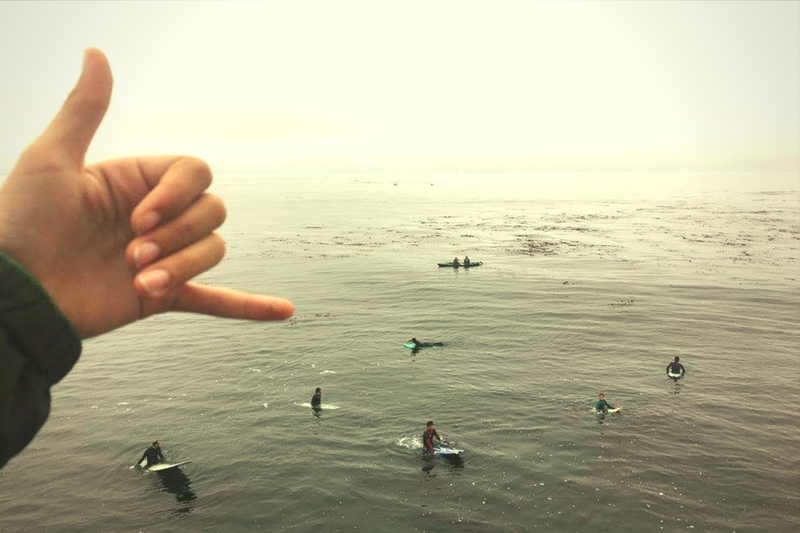 The California travel adventure program was developed for the absolute beginner to the advanced surfer. There are so many breaks that are suited to different levels of surfing that it allows us to accommodate everyone’s surfing ability. More advanced surfers will be coached on more complex maneuvers while beginners will work on the basics with our top instructors. Do you provide equipment or should I bring my own? All equipment is provided. We provide a variety of boards to use during your California adventure. There are shortboards, fun boards, fishes, and longboards available for you to use. Intermediate to advanced surfers can bring up to two surfboards. 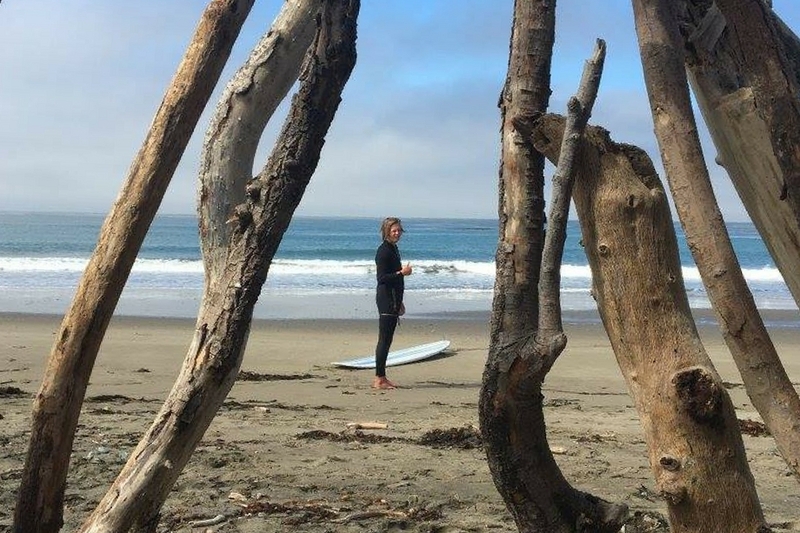 While the beaches around Morro Bay will be some of our primary surfing breaks during our California Surf Camp, we’ll also travel the coast from Monterey to Santa Barbara exploring the culture and the different breaks. This allows us to get a really rich surf experience, in addition to seeing some of the most beautiful coastlines in California. We will be taking taking high quality, high resolution photos throughout the week. We will be posting pics to Instagram and FaceBook as well as viewing them at camp.